The reactions to Venoco’s announcement weren’t all celebratory. Santa Barbara County 1st District Supervisor Das Williams is “generally critical of oil,” he told the Sun, but he still found it difficult to get too excited about the news. He expressed concern over who would pay for Holly’s decommissioning—Venoco, or taxpayers? Both Williams and 4th District Supervisor Peter Adam expressed concern that the closure of Venoco’s South Ellwood oil field operations would mean lost revenue for Santa Barbara County’s general fund, which is currently facing a deficit in the tens of millions. Adam is decidedly “pro oil.” His reaction to the loss of Platform Holly was anything but optimistic. Carbajal began his career in the House of Representatives this year with the introduction of the California Clean Coast Act, which proposed banning all future offshore oil and gas leasing in state and federal waters. Unlikely to move forward under the House’s Republican control, the congressman’s first piece of legislation demonstrates his commitment to scaling down offshore oil production in the state and in his home county. The announced closure of Platform Holly and the following public outcry—both positive and negative—underscore the local, statewide, and national debate regarding oil, climate change, and energy independence. Local environmental activists launched into urgent action after the Refugio oil spill, while established oil companies like Venoco have struggled with the aftermath of the spill. At the same time, those companies have been trying to maintain and sometimes expand operations. 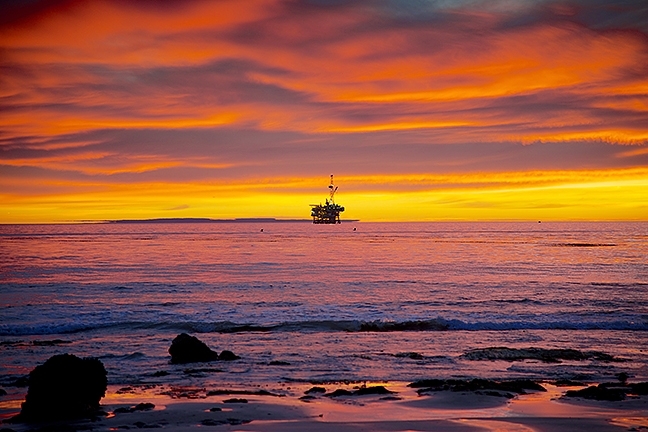 And the battle rages on as local environmentalists take the closure of Platform Holly as a win while those in support of the industry decry restrictive regulation and argue for the oil industry’s economic impact in the Santa Barbara County. The county’s tourism sector suffered, he said, from hotels to restaurants to companies that led tours in the Santa Barbara Channel. Various segments of that local economy are seeking compensation from the pipeline company. A complaint filed Feb. 3 by attorneys representing the Santa Barbara Adventure Company against Plains All American Pipeline in Santa Barbara County Superior Court seeks reimbursement for damages to the outdoor recreational company, which offers equipment sales and rentals, guided tours or hikes, surfing and kayaking lessons, instructional camps, and other services and outdoor activities. The Santa Barbara Adventure Company isn’t the only business operating in the Santa Barbara Channel now seeking damages from Plains. Venoco filed an amended complaint in October 2016 seeking a jury trial against Plains. Venoco is also seeking damages from Plains, citing the company’s multiple violations of federal and state legislation and the losses Venoco incurred since Line 901 shut down. Venoco is seeking more than $20 million, according to the complaint. In the complaint, Venoco alleges that the lack of routine pipeline maintenance and safety protocols that led to the Refugio spill are part of a larger pattern of behavior for Plains. The complaint said Plains “has been cited for over 175 violations of safety requirements, causing nearly $24 million in property damage,” including several incidents in California. 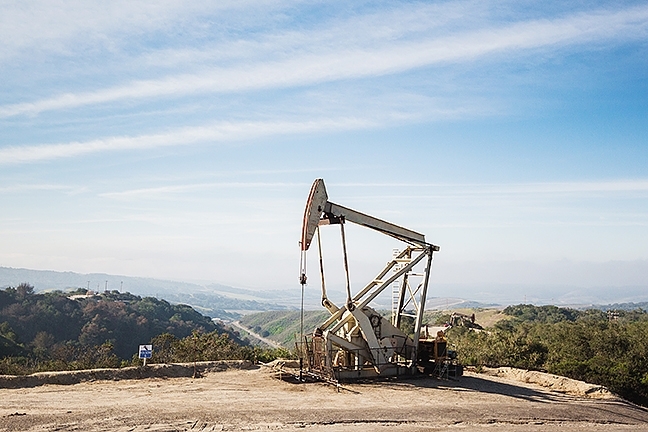 When the Pacific Coast Energy Company’s proposal to double the number of wells at its Orcutt Hill operation was denied by the county Board of Supervisors last year, the decision was hailed favorably by environmental groups and decried by industry advocates. Venoco’s filing for Chapter 11 bankruptcy allows the company to restructure and sell some of its assets while maintaining its regular operations. The filing won’t affect Venoco’s claims against Plains, according to the April 17 statement. Venoco applied to the city of Goleta for an emergency permit in 2015, just after the Refugio spill, to move more than 5,000 barrels of oil by truck from the Ellwood Onshore Facility. The emergency permit was denied, but trucking was allowed for the facility’s remaining oil under Venoco’s then existing permit with the city. However, Venoco was not allowed to continue production on Platform Holly and truck more oil from the onshore facility. According to County Supervisor Adam, Venoco could have applied for a long-term permit to truck oil harvested from Platform Holly, but the company didn’t. While the Refugio spill and Plains All American Pipeline may have contributed to Venoco’s woes with Platform Holly, Adam also points a finger at the regulatory climate in the state and county. Past votes on oil projects by the county Board of Supervisors inform his view. Supervisor Williams, who describes himself as a “strong environmentalist,” sees Venoco’s struggle with the South Ellwood oil field in a different light. He pointed to the board’s March approval of an 18-month lease extension for the submerged pipeline that transports oil from Platforms Gail and Grace—which reside in federal waters—to Carpinteria as proof that the county still cooperates with the oil industry. As for Venoco abandoning Platform Holly, it wasn’t too much regulation that caused the company to go that route, Williams said. “I was reflecting on, after many battles over oil, the factor that kills Platform Holly and Venoco as a company is not the protests by environmentalists. It’s not the regulation, but it was in fact the lack of regulation on pipeline safety,” he said. “It was really the negligence of Plains All American Pipeline and the very fact that they were only regulated by the feds, who never look at safety data, unlike state regulatory bodies. “So the strange irony occurred to me that Venoco was put out of business by there not being strong enough environmental regulation,” he added. Williams also pointed to how expensive trucking oil is, and for a company that was already struggling, it just didn’t pan out. Linda Krop, chief legal counsel for the Environmental Defense Center (EDC), said that Venoco was already having financial problems before the Refugio spill. The EDC formed just after the 1969 Santa Barbara oil spill, offering legal counsel and representation to environmental groups. The EDC opposed Venoco’s attempts to expand drilling from Platform Holly, Krop explained, working at the state and local levels to fight the company’s various applications. Krop takes Platform Holly’s decommissioning as a win. She also said that the deciding factor was neither overregulation nor the Refugio spill. According to Sabrina Lockhart, director of communications for the California Independent Petroleum Association (CIPA), regulations affect oil companies’ bottom lines, but the market plays a deciding factor. CIPA is a nonprofit trade association that represents oil and natural gas producers in the state, Lockhart explained, and the association’s clients have felt both the regulatory and economic strain on their companies. In Santa Barbara County, according to Lockhart, oil companies large and small provide more than 5,000 jobs. Those workers are paid a collective income of around $506 million each year, she said. The prospect of losing high-paying, high-skilled jobs isn’t lost on legislators like Rep. Carbajal, whose proposed California Clean Coast Act includes considerations for workforce training in renewable energy sectors. Carbajal said he is “concerned for their jobs as well,” but still sees the need to move forward with clean energy as a priority. On April 17, the day that Venoco announced it would cease production at Platform Holly, U.S. Secretary of the Interior Ryan Zinke visited the Reagan Ranch Center in Santa Barbara to speak to a private audience. He was met at the door by hundreds of protesters, according to reporting by the Santa Barbara Independent, sporting signs clearly opposing the expansion of the oil industry on federal property, including offshore. The following week, President Donald Trump signed two executive orders: one undoing former President Barack Obama’s ban on offshore drilling in much of the U.S., and another to review national monuments created since 1996, including the Carizzo Plain National Monument, designated by Obama. 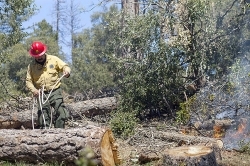 Critics believe the review process could open up protected lands to development, including oil. The EDC’s Krop said that her organization is “looking at everything” in the executive orders. Meanwhile, environmental groups like the Sierra Club and the Santa Barbara County Action Network (SBCAN) are mobilizing locally to oppose any development in Carizzo and elsewhere in the county. Most recently, the EDC, Sierra Club, and SBCAN have worked to block expansions at the Orcutt Oil Field by both Santa Maria Energy in 2013 and the Pacific Coast Energy Company (PCEC) last year. Neither PCEC nor Santa Maria Energy offered a response to the Sun’s requests for comment. PCEC’s proposed expansion would have drilled 96 new cyclic steam extraction wells, but was denied by the county Planning Commission and again when PCEC appealed to the county Board of Supervisors in October of last year. 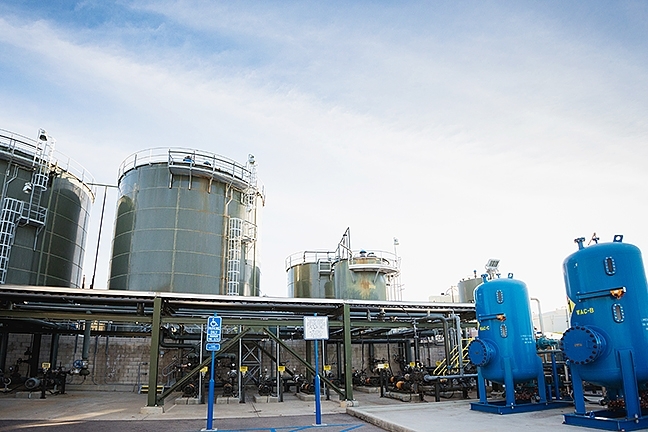 The Pacific Coast Energy Company’s operations at the Orcutt oil field use cyclic steam extraction techniques. Groups like the Santa Barbara County Action Network and the Sierra Club have argued that the technique is dangerous to local endangered species whereas industry advocates say it’s a clean and safe method. At a May 11 roundtable for SBCAN, Hough and board member Janet Blevins led a small group of volunteers in a discussion of the nonprofit organization’s priorities. The group was trying to narrow down SBCAN’s focus in an effort to maximize effectiveness. The group reviewed a list of “environmental challenges” in the Santa Maria Valley, which included the heading “oil industry challenges.” But one attendee had circled others, including “air quality,” “water resources,” “climate change,” “soil contamination,” and more, writing the word “oil” next to each of them. They talked about the possibility of oil seeps at Orcutt Hill or spills at Cat Canyon, the possibility of groundwater contamination in the valley, advocating for renewable energy expansion, homes in Santa Maria with contaminated soil, and the number of capped oil wells in town. In an email to the Sun, Battles said that Platform Holly is actually responsible for curtailing natural seeps from the South Ellwood oil field. Those seeps are going to get worse without extraction, he said. He also waved away claims that Santa Maria’s capped wells could contaminate the aquifer. “The oil industry in Santa Barbara County produces more oil with lower contaminates today than we ever have,” Battles wrote. The attendees at the SBCAN roundtable also talked a great deal about renewable energy expansion at the behest of climate change. Both Battles and Supervisor Adam expressed doubt about climate change. Though Supervisor Williams doesn’t agree with Adam on the matter of climate change and the approach to the oil industry, he could agree that the battle came down to ideology. “I think it shouldn’t be that way, but it is,” Williams said. “But I think the more some people deny the science of climate change, the more hardline pro-science and pro-environment people get. “So, it’s got more ideological, and each side’s hardline feeds the other,” he added. Contact Managing Editor Joe Payne at jpayne@santamariasun.com. * Correction, May 24, 2017: This article was edited to reflect the fact that not all of the oil spilled by the pipeline in the 2015 incident made it to the ocean.